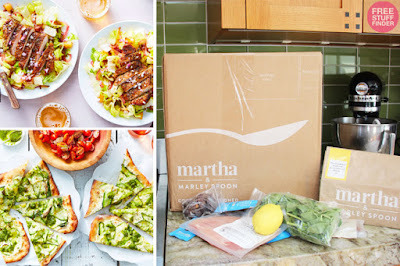 For a limited time, score $30 off your first order from Martha & Marley Spoon – Martha Stewart’s new home delivery meal kit! This chilled recipe box includes everything you need to get dinner on the table, including easy-to-follow recipe cards plus fresh, pre-portioned ingredients sorted into dish bags for grab-and-go cooking. This is one of my favorite ways to treat myself during a busy week; meal-delivery kits like this make it so much easier to get a healthy meal on the table for family dinner! Choose your number of meals – You can even choose to make your box vegetarian! Tip: Choose 2 meals per week for 2 people to score your first box for just $18! 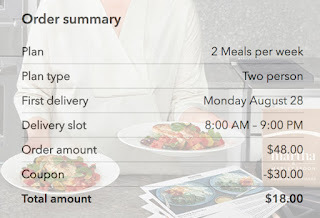 Final Price: As low as $18 + FREE Delivery for 2 meals for 2 people – just $4.50 per plate! This is a great chance to try out this new service at a super low price. Meal kits are a fun way to learn how to cook new recipes. Plus, it’s so nice to be able to skip a trip to the grocery store!